Twelve months ago, Novak Djokovic headed Down Under with a score to settle after an epic five-set quarterfinal loss to Stan Wawrinka in 2014. Last January, Djokovic would meet Wawrinka again, this time in the semifinals, and this time Djokovic would be the victor. Djokovic would go on to defeat Andy Murray in the Australian Open final, and from that point on, the Serb was almost unstoppable. By the end of the 2015 season, Djokovic had won 11 titles, including three Grand Slams, and finished the year with an incredible win-loss record of 82-6. To celebrate Djokovic’s historic season, we present his 2015 interactive Game Tree. 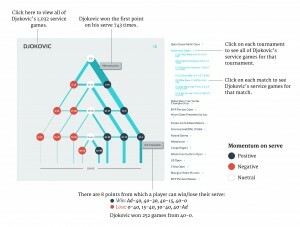 Djokovic’s Game Tree allows you to explore his 1033 service games played in 2015. This rare point-by-point summary shows where Djokovic’s history-breaking season was won – and rarely lost. 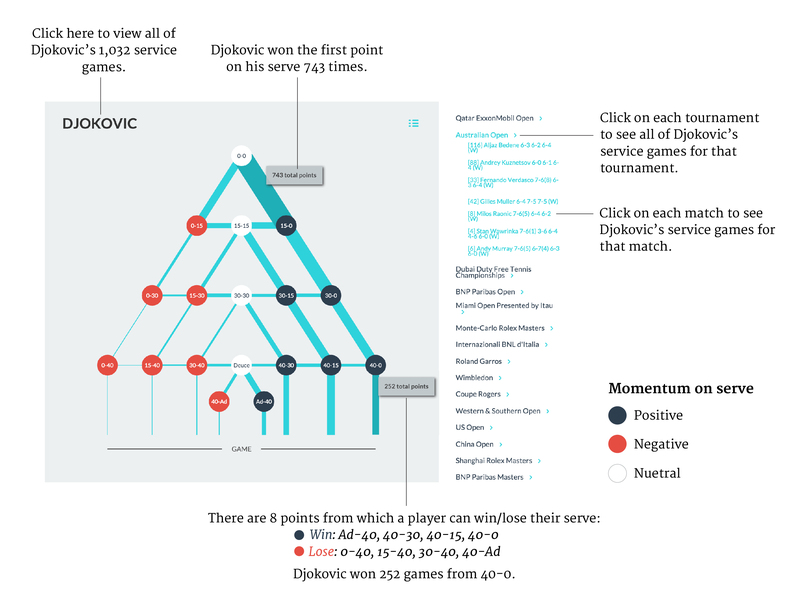 The game tree shows how dominant (or not) Djokovic was on serve during the 2015 season. This unique visualisation gives us a better understanding of the final score, and how close Djokovic’s service games were. Each point in the game tree is color-coded to reflect the momentum in each of Djokovic’s service games. A match that is dominated by Djokovic is highlighted with a thicker, outside flow through the ‘positive’ points of the game tree. More tightly-contested service games result in thicker lines through the ‘neutral’ and ‘negative’ points of the Game Tree. Click on each line to reveal how many times the player won or lost that point. • Djokovic played 1033 service games in 2015. • He won 923 (89.4 per cent) of his service games. • He won almost one-third (29.2 per cent) of his service games from 40-15. • His most successful point is at deuce, where he wins 81.3 per cent of the time. • His least successful point is at 15-0, where he wins 65.9 per cent of the time. Not all of Djokovic’s service games were straight out the textbook as his results might suggest. Yes, he was brutally dominant at times against players like Marcos Baghdatis at the BNP Paribas Masters, where Baghdatis failed to put any pressure whatsoever on Novak’s serve (see below). We saw many more tightly-contested service games in his match against Tomas Berdych at Monte Carlo. The game tree shows that Berdych had some serious opportunities, having Novak 0-30 six times throughout the match. Unfortunately, Djokovic was able to wrestle back the momentum from half of these points and went on to win the match 7-5 4-6 6-3. Andy Murray, one of the few players beat Djokovic in 2015, did so at the Coupe Rogers in Toronto. Murray piled on the pressure and pushed Novak to deuce six times throughout the match. Murray won half of these and would break one other time at 30-40. That would be enough for a rare victory for Murray. Djokovic’s 2015 season was no doubt one for the ages, but he didn’t always have it his own way as the results might suggest. The final score of course is only a small part of a much larger and more complex story, and the game tree enables us to better understand that score. Here we have explored just a few interesting examples of patterns and trends that we may have not have seen using conventional tennis reporting methods. I encourage you to use the game tree to take a deeper dive into some of Novak’s classic matches last year and to see what might have been for some of his closest rivals, as they begin their assault to dethrone the undisputed 2015 king of men’s tennis. The Djokovic v Nishikori match at World Tour Finals is not included due to incomplete data.